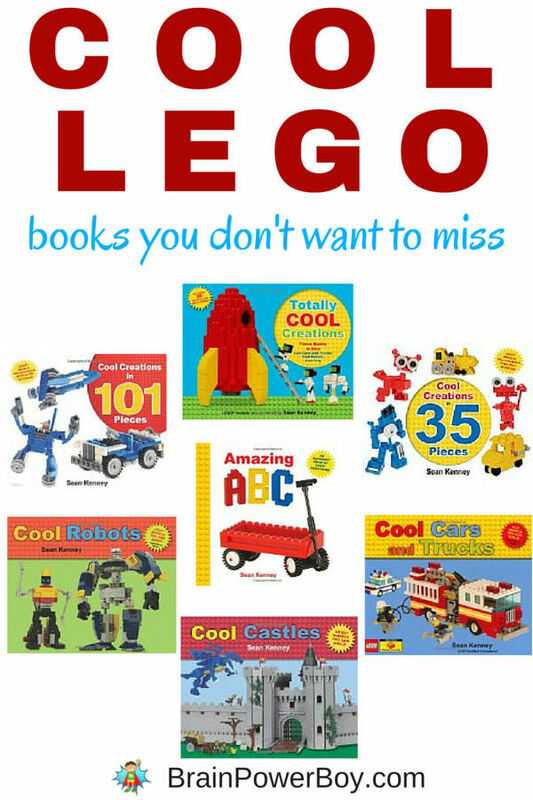 Cool LEGO Books You Don't Want to Miss! If your boy loves LEGO as much as mine does, you have to check out these cool LEGO books from Sean Kenney. Sean is an awesome LEGO designer/brick builder who lives in New York City and spends his days immersed in LEGO. These books are very well done. In fact, they are some of the best books for boys we have seen recently. Sean tells you what pieces you need and gives step-by-step directions for building. See all of Sean Kenney’s LEGO Books in one place by clicking through the link. Each book is a young LEGO builder’s dream. Pick a topic: robots, castles, city, cars, trucks, or one of the books that has a variety of creations and let him build to his heart’s content. Sean has come out with a whole series of books called Cool LEGO. I’m telling you, we have seen them all and they are all very good. What I love about them is that they are visual. The instructions in his books are very similar to the instructions in a LEGO set. Cool Robots is full of robots. Funny robots, neat robots and futuristic robots. This book is a hit with kids who love to create. There are a lot of really great ideas for making your own robots or you can follow the instructions and make the ones pictured. It is so fun to create a variety of crazy robots out of bricks. My son and I designed quite a few robots and some of them were very cool indeed. Make your own Cool City out of LEGO bricks. I know a lot of kids do this so this book will come in handy for learning the best way to construct your buildings as well as for making neat extras like ice cream trucks and a skyscraper. This book includes stickers for your buildings. We like fantasy. If your boy does too Cool Castles is a neat book to own. Build a castle, a town, animals, a dragon and more in this highly detailed book. This is one of my favorites. Cool Creations in 35 Pieces is a gem. Every creation is made from a set of 35 pieces shown at the front of the book. We had all of the pieces from various sets. I like this book for its simplicity. Many boys will be able to build the wide variety of items include in his latest book. There are robots, sci-fi spacecraft, buildings, furniture, vehicles, household objects, animals, aliens and more! Sean released another Cool LEGO book- yay! Cool Creations in 101 Pieces Because you use more pieces, you can build neater things. Makes sense right? These models are more detailed and you still get Sean’s excellent directions and tips for building with LEGO bricks. Cars, space, robots, accessories for a house and more are included in his new title. It is a winner! Oh, and for younger kids, or alphabet book enthusiasts (like myself!) he created an Amazing ABC LEGO book. If you want to order the specific pieces in the books, we recommend going online to the The Official LEGO Shop and ordering the pieces you need from the Pick-a-Brick section of the site. Honestly, they are all good. I would start with the subject that your son likes best and move on from there. With so many titles to choose from you are sure to find a book that your LEGO builder will enjoy. We can’t wait to see what will be next from Sean Kenney. For more of Sean’s creations (they are so good!) and to hear what he has to say about what kids can learn from playing with LEGO see this article: Sean Kenney kindly granted us an interview.